Wonderful space - even if it is cramped - sure looks spacious and well-loved and used! Your designs are beautiful! Thank you for sharing.... And I love love love your inspiration. Take care. I love your creative chaos and that you surround yourself with inspiration. 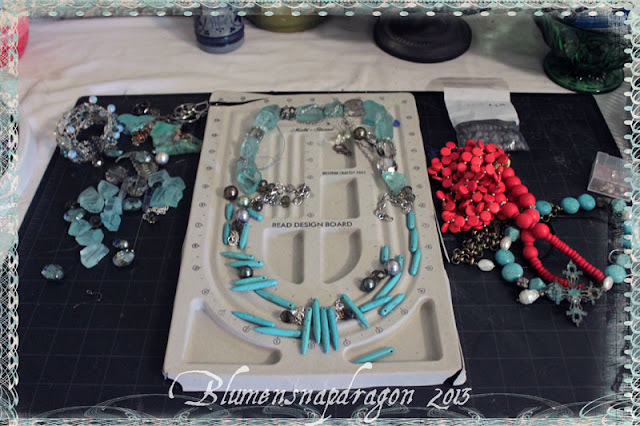 Love your turquoise necklaces you're working on. I am a local, too, I live in Gilbert. You have a lovely studio space and your jewelry is gorgeous. 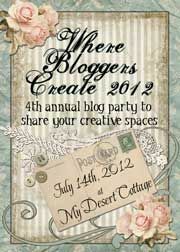 Stop by my blog if you get a chance. wow, lovely studio, nice to see all that jewelry!!! Thank you for visiting my little studio space too and taking time to leave a comment. You have a lovely space and your jewellery is wonderful!! I love that both your space and your supplies have such deep meaning to you! Thank you for sharing your space with us all. A lovely space of your own, and pretty jewelry. 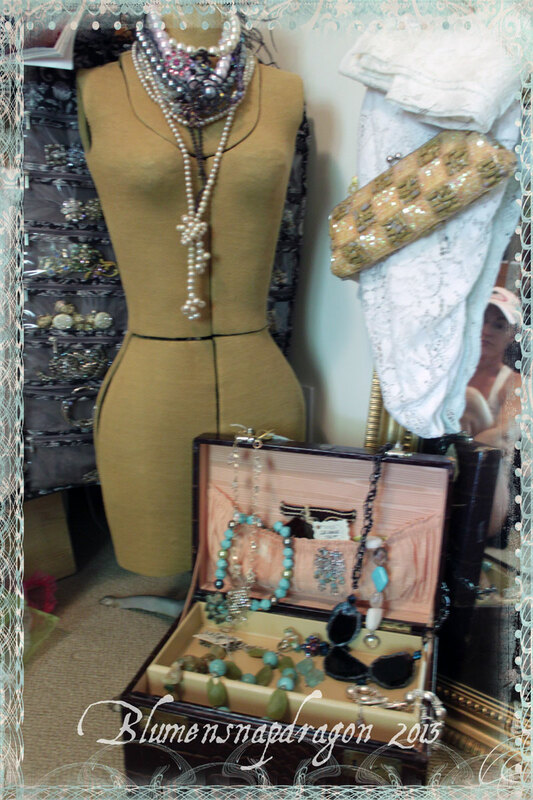 Beautiful new/ vintage jewelry pieces! 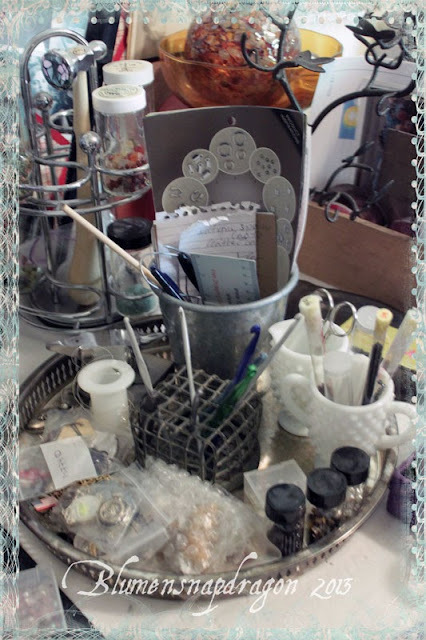 What a lovely place to create--I love all the ways you have come up with to store your tools, precious stones and other baubles. Thanks so much for sharing. Devon-- your blog is beautiful-- I love the name!! 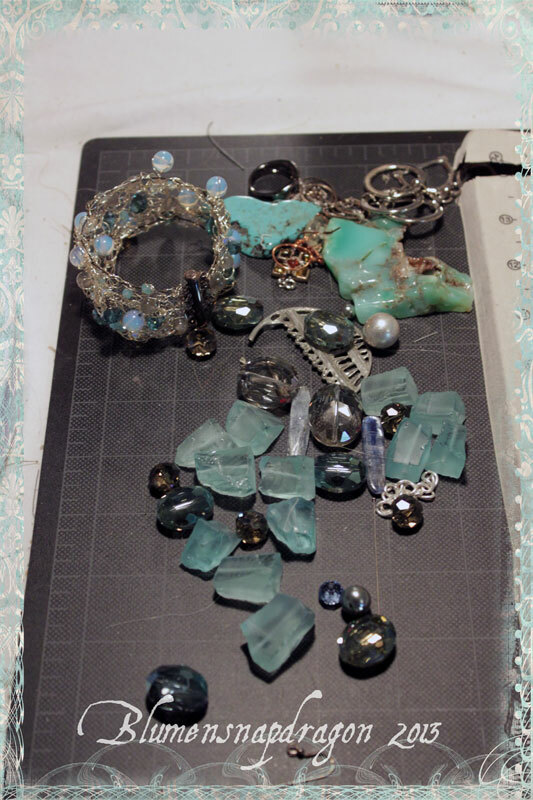 Your gems and stones are SO beautiful-- it would be so wonderful to create beautiful jewelry with stones like yours. Your creations are stunning. You've taken a small space and turned it into a great place to create-- kudos to your organization skills-- I could take lessons from you! Your jewelry is beautiful! And I LOVE that bumper sticker from CA ~ it's an amazing question! Very nice space! Thanks so much for sharing! Hugs! I do so love a good button and bead collection. You do wonderful things with them too. I love how you revealed your dress form, wonderful surprise under there. Keep smiling and creating thanks for sharing. How fun that you have a train case from your mother. I enjoyed visiting your creative space. your necklace is lovely. cheers from singapore. I really enjoyed visiting your craft space...it's beautiful!! You have a lovely collection of things in your room, especially the jewellery case and your dress form. I'm like you, I find myself lokking through fabric for a certain project, then come across something I'd not seen for a while and start musing on what to make with that! Thank you for the look around your room. Happy crafting (your jewellery looks lovely). 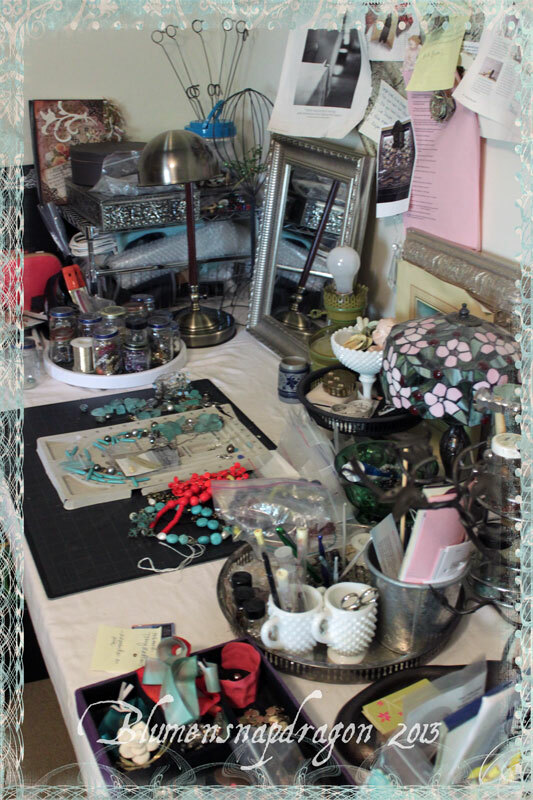 Oh you are so right, we have to be surrounded by our treasures to be inspired! Thank you for sharing your creative space. Wow! 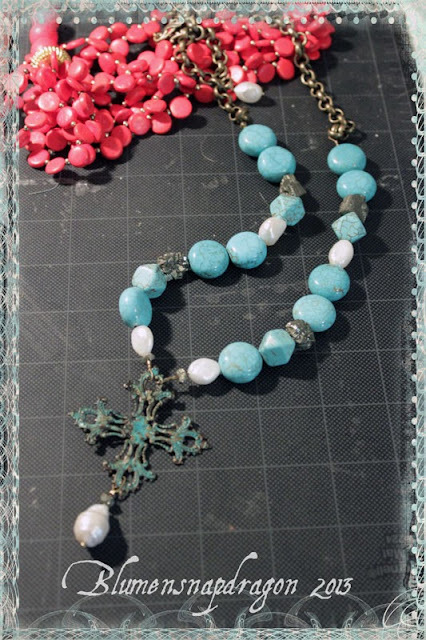 I'm impressed by anyone who can create fabulous jewelry from odds and ends, discarded pieces of jewelry, etc. I love your inspiration board as well and had to pin it. Thanks for sharing your wonderful and inspirational space. Thank you for the visit and your nice comment Devon! You speak my language great! :) I think your space looks very organised! Love your jewelry! 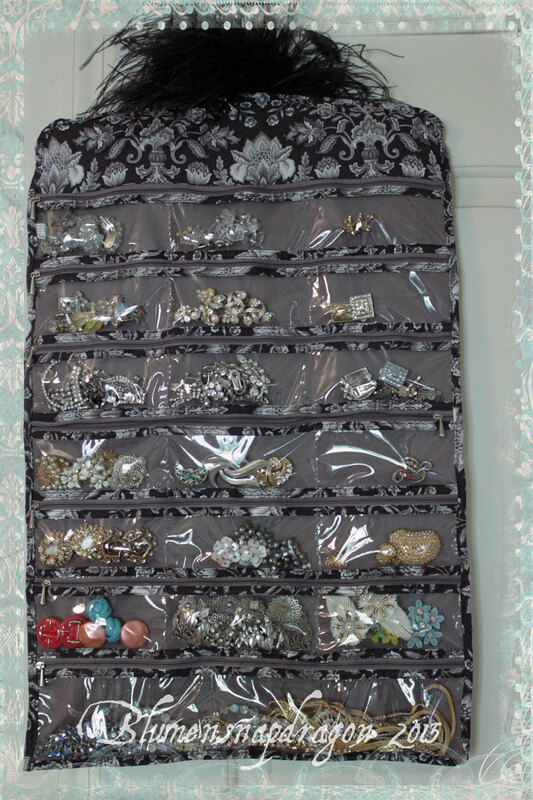 The zippered compartment organizer on a hanger? SO going to go buy one! I've seen them every time I go into Marshalls or TJMaxx. NEVER thought - craft supplies! (Duh) Thanks for the inspiration! 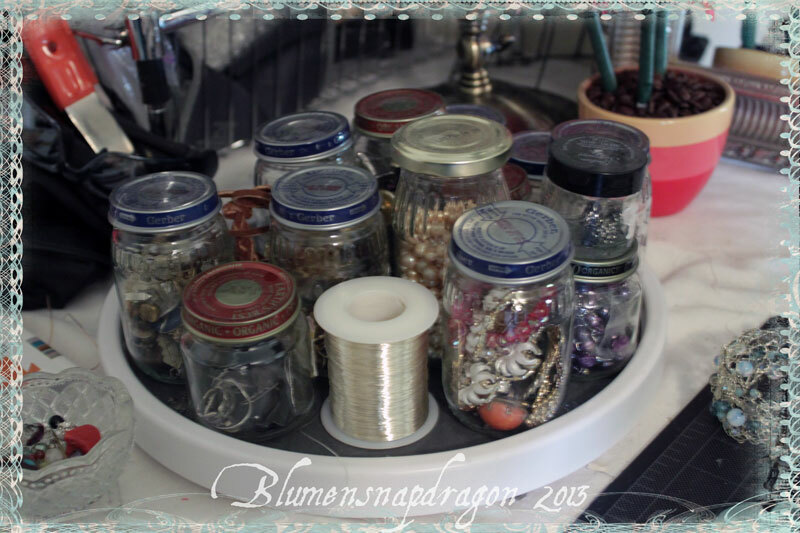 So wonderful that you could create a dedicated space out of your room, just for your beautiful craft! 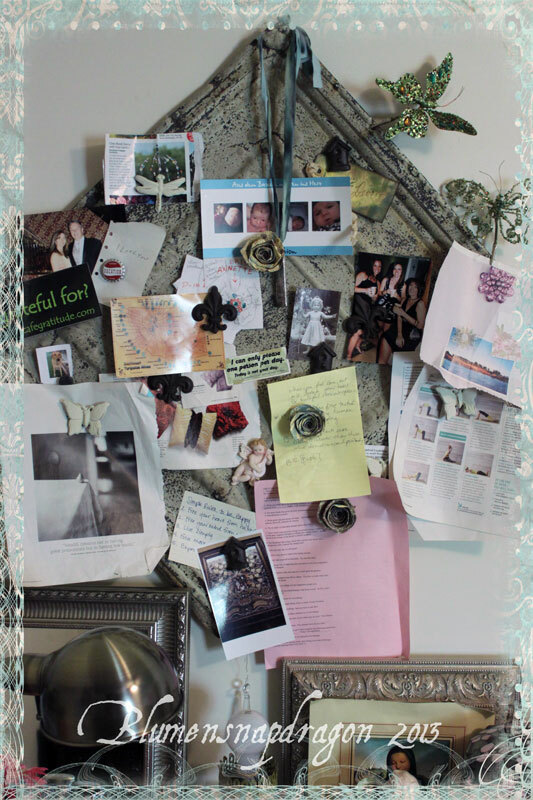 Your work is lovely, I adore the bulletin board! Thank you for sharing. Love your space and your designs are gorgeous. I love all your organization and unique storage ideas. 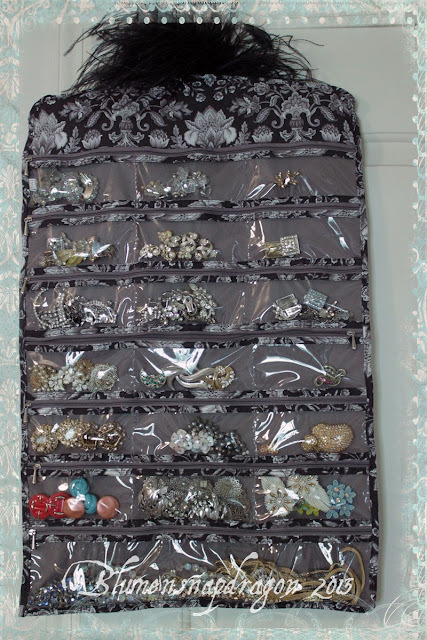 I too enjoy using the lazy susans and the hanging jewelry bag is perfect for all your supplies and treasures. You are a true talent. Love seeing your creative space. So enjoyed my visit. I admire you skills as a jeweler. Beautiful work! Thanks for sharing. Love your little space and how you work with all your jewelery and the way you store all those precious pieces with your paper roses and angels watching over you! That case that belonged to your mother is absolutely gorgeous and precious! Snapdragons are one of "her" very favorite flowers! "She" too likes to make them talk. I don't mind them, but they taste alot like all the other flowers, so typically, I just leave them alone. For that reason and.....well.......what if one of them decided to bite me?!?!? Oh the horror. And embarrassement! Can you hear the questions?! "Hey Romeo how'd you get that fat lip?".... "Oh I got bit by a ferocious snapdragon".... see my point?! Snapdragons, you girls go ahead and admire. Me, I think I'll head the catnip patch. Loved your studio especially that space there on the desk. It was the purrfect size for me to lay and admire all your work and treasures!!! 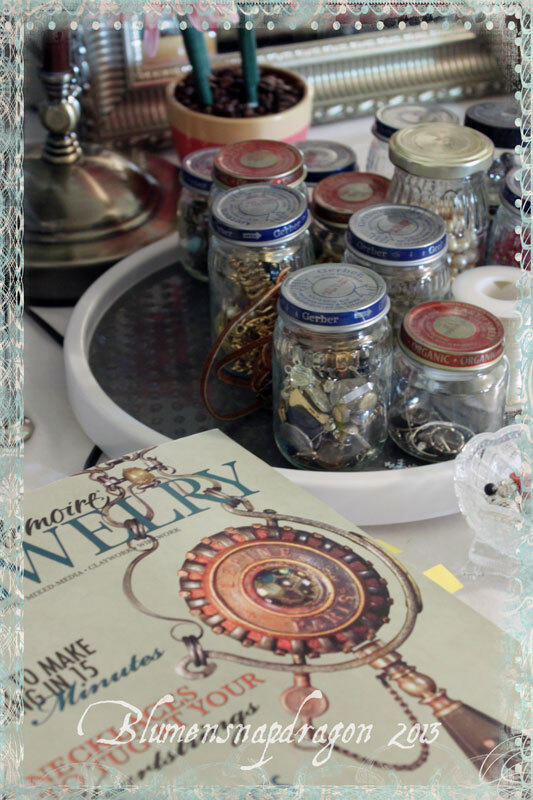 You create beautiful jewelry and we really appreciate that you let us have a peak into your creative zone! Love all your treasures and your jewellery designs are beautiful. 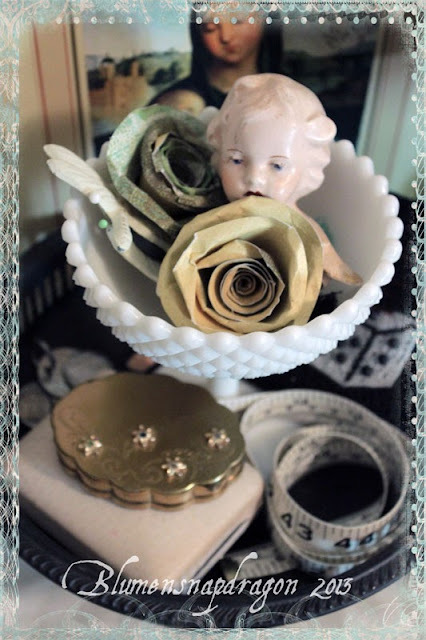 Lovely blog and creative space, thanks so much for sharing. What exquisite jewels and other beauties you have. I love your work and you must be a very busy lady. I love your work space.AND I love that word you used ...uniquities...LOL...I must use that word. Ooh, all those turquoise beads...love them, and all of your jewelry. And your mom's train case! I always have at least 3 projects going on at once, so I can relate. Thanks for the tour and take care! Thanks so much for sharing!! Loved the tour of your space!! Devon, I so enjoyed the tour of your studio. I think I would feel right at home there and would hardly get any work done though with all of the beauties around! 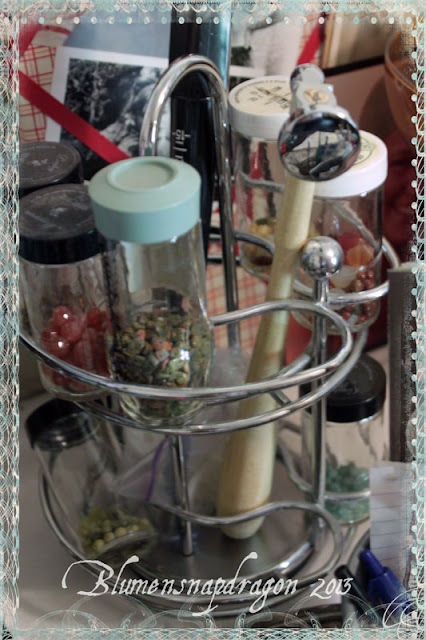 :-) You have such great storage ideas - the baby food jars are much prettier than plastic tubs. I can see how they would become difficult to transport - but pretty nonetheless. Looks like you have a number of beautiful projects in the works. I like to spread my things out on the floor as well, and as I type, I have 3 bracelets going. I felt like I could really relate! 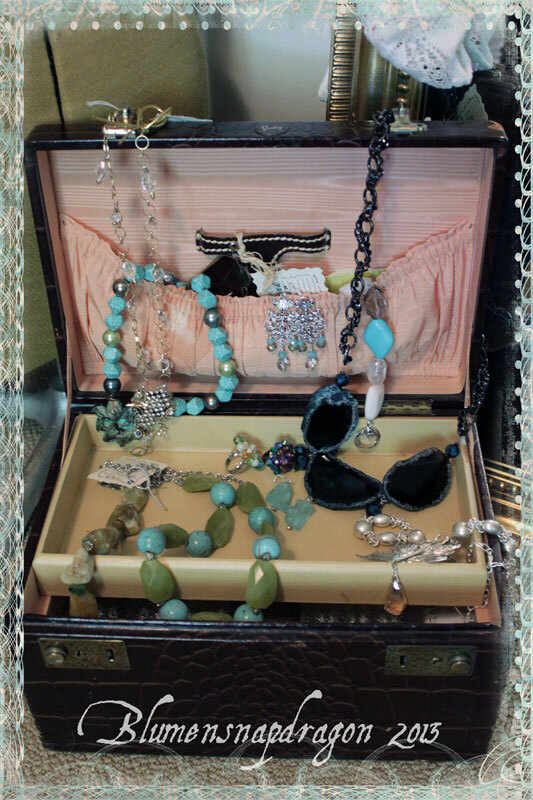 So sweet that you still use your Mom's train case to travel and to display your jewelry - what a treasure! Thank you for sharing your beautiful studio! Great space, I enjoyed the tour, thanks for sharing!